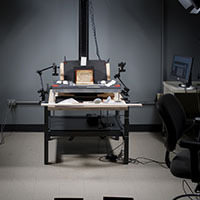 All manuscripts were assessed for condition and ability to be digitally photographed by a staff team, including the Preservation Manager in Special Collections, the Head of Conservation, the project manager and the photographer. The assessment was an opportunity to record the condition prior to imaging and to discuss handling issues. Each manuscript required customization of a cradle that holds the manuscript in place and in focus during photography. To reduce stress on the manuscript, handling was minimized by photographing all recto pages first and then all verso pages. Manuscripts were photographed using a Betterlight Super 8-K scanning back camera with HID lamps. Capture was cover to cover, at 600 spi and tiff files were saved as 24-bit tiff files in Adobe RGB 1998 color space. Equipment was calibrated prior to each manuscript being scanned. 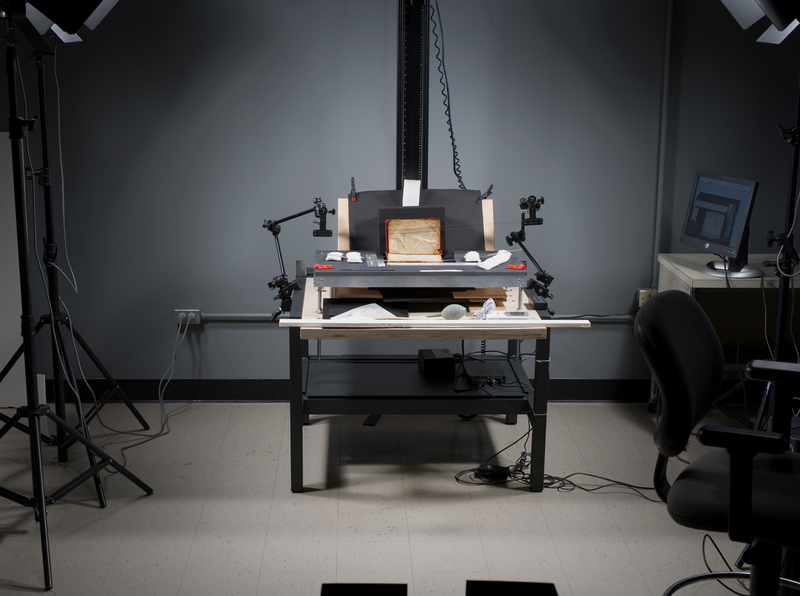 Two manuscripts were photographed prior to the grant period for a pilot study, using a Kodak DCS Pro 14n Digital Camera. File level technical metadata is extracted using JHOVE at the point of archiving. Structural metadata is recorded in a Microsoft Access database in order to correlate folios or pages to digital objects. To further aid discovery, a wide range of the manuscripts' physical features and the content of both text and image are also captured. These elements encompass heraldic devices, colophons, inscriptions, names of scribes and artists, writings such as hypotheses and prologues, lectionary readings, saints' names, and the titles of miniatures. In encoding the manuscript descriptions, the metadata specialist utilized the Text Encoding Initiative's TEI P5: Guidelines for Electronic Text Encoding and Interchange: Manuscript Description. The TEI DTD used is available from the Digital Scriptorium of Columbia University, although to accommodate specific project needs, it was first edited and extended with local tags. The process of editing included equating Decoration with the seven recognized components of the TEI Manuscript Description guidelines which are Identifier, Heading, Content, Physical Description, History, Additional, and Manuscript Part. Initially a subset of Physical Description, the new component Decoration has been repositioned subsequent to Content, not only to emphasize intellectual substance, but also to augment visibility by providing links from the record, through encoding, to the digitized imagery of the Web display. New local tags appended to the DTD are chiefly those needed to describe the content of miniatures, and the structure of canon tables, headpieces, and initials. Place names have been checked against the Getty Thesaurus of Geographic Names. The titles of miniatures are taken mainly from the Index of Christian Art, Princeton University. The controlled vocabulary for subjects and personal names is drawn primarily from the Getty Art and Architecture Thesaurus, the Library of Congress Authority Name File, and the Library of Congress Subject Headings. the primary system of Armenian alphabet transliteration followed is ALA-LC. Kurt Aland, Kurzgefasste Liste der griechischen Handschriften des Neuen Testaments (Berlin; New York: W. de Gruyter, 1994). Kenneth W. Clark, A Descriptive Catalogue of Greek New Testament Manuscripts in America (Chicago: University of Chicago Press, 1937). Greek-English New Testament: Greek text Novum Testamentum Graece, in the tradition of Eberhard Nestle and Erwin Nestle, edited by Kurt Aland, et al. (Stuttgart: Deutsche Bibelgesellschaft, 1992). Frederick G. Holweck, A biographical dictionary of the saints: with a general introduction on hagiology. (St. Louis, Mo. ; London: B. Herder Book Co., 1924). Neil R. Ker, Medieval Manuscripts in British Libraries, 5 v. (Oxford, Eng. : Clarendon Press, c1969-2002). Gregory A. Pass, Descriptive cataloging of Ancient, Medieval, Renaissance, and Early Modern manuscripts (Chicago: Association of College and Research Libraries, 2002). Lilian M. C. Randall, Medieval and Renaissance Manuscripts in the Walters Art Gallery (Baltimore; London: Johns Hopkins Press, 1989). Avedis K. Sanjian, A catalogue of Medieval Armenian Manuscripts in the United States (Berkeley; London: University of California Press, 1976). The SBL handbook of style: For ancient Near Eastern, Biblical, and early Christian Studies, edited by Patrick H Alexander (Peabody, Mass. : Hendrickson Publishers, 1999). To support close examination of the manuscripts, each page image is presented using Zoomify, a software which allows for fast zooming and panning of the high resolution files over the web. The detailed bibliographic and structural metadata is used to provide a multi-tiered access to the manuscripts in the collection, allowing researchers to delve into the content of the materials in interesting ways. Researchers can explore the collection using features at the manuscript level, such as language, date, and place or origin. Using the detailed structural metadata which has been compiled, the interface also provides access to significant features within the manuscripts, such as books of the bible or miniatures of a particular scene, allowing researchers to find all of the pages across the collection that match such criteria. Search results of this type link the researcher directly into the exact page of each of the manuscripts where the content occurs. This allows researchers to compare similar textual and visual content across the manuscripts in the collection even though the manuscripts have not been transcribed into full text. Please direct questions or comments to goodspeed@lib.uchicago.edu.